R57 Chrome Letter Badge or Emblem. 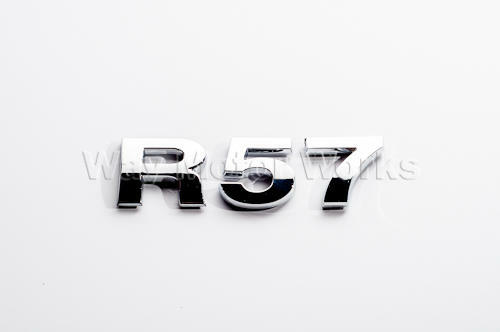 This is a high quality set of the R57 letters to let you show what your car is. MINI enthusiast will know what it means. Each letter is approx 1 inch tall and a great match for the Cooper that comes on your MINI. These R57 letters have high strength adhesive on the back to make them stick for a long time. They are easy to stick, just make sure you have them where you want them, and straight. R57 is the internal designation from MINI for the 2009-2013 MINI Cooper Convertible, Cooper S Convertible, and JCW Convertible.